Category 3 Communications Cable on a Spool. 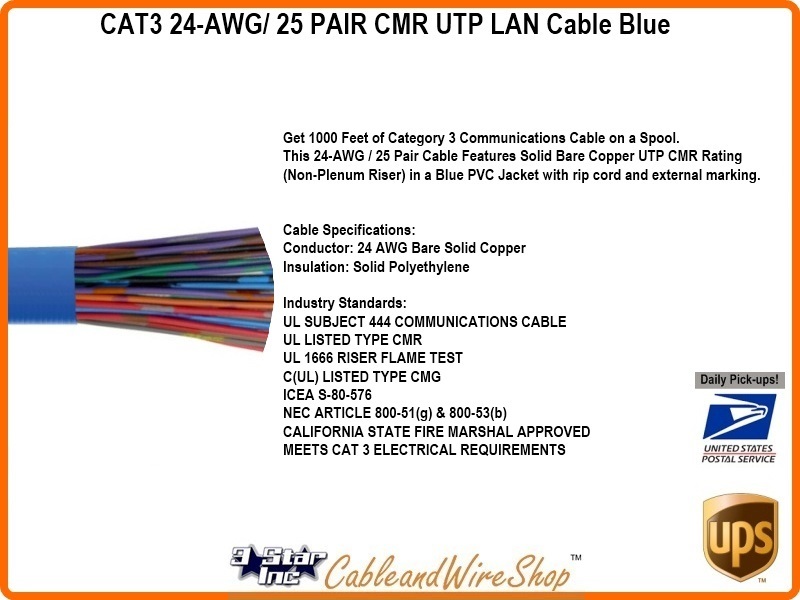 This 24AWG / 25 Pair Cable Features Solid Bare Copper UTP CMR Rating (Non-Plenum Riser) in a Blue PVC Jacket with rip cord and external marking. Note: Cat3 cable is still in use as a Voice grade cable, primarily for POTS (Plain Old Telephone Service) and though some data can be sent through it (Think DSL) the rate is limited to about 10 Mbps and is subject to more errors than moderngrades of LAN cable. Even for Telephone service, if you are replacing or Installing lines in your house, you can't go wrong investigating the use of Cat5e or Cat6 cables as future uses and extra lines are built in. What is Category 3 Cable? CAT3 Telephone Cable (UTP) stands for Unshielded Twisted Pair cable designed to reliably carry data up to 10 Mbit/s, with a possible bandwidth of 16 MHz. It is part of a family of copper cabling standards commonly used everyday that also includes CAT5, CAT5e and CAT6. Category 3 was a popular cabling format that was used for voice and data for years. Cat 3 is currently still in use in two-line telephone systems as Millions of Homes and Offices are still wired with CAT3 for Voice and Technically, the trunk and distribution cable used by the Telephone company to get to your home or office from their Central Office is CAT3 as well. Since the early 2000s most new structured cable installations are built with Cat 5e cable or Cat 6 cable as it can be used with Voice or Data without being "Stuck" later. We have Outside Plant (OSP) and Premise CAT3 cables for your long or short distribution needs.